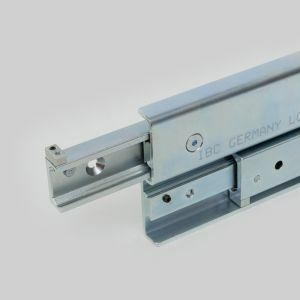 In addition to its well-known range of rotating bearings IBC also offers linear motion bearings as C-profiles with an internal raceway. This produces a very compact and space-saving system that can also be used if external systems take up too much space. A distinction is made here between the following two forms: Telescopic rolling bearings and linear motion bearing carriage systems. 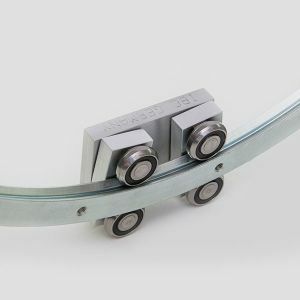 IBC linear motion bearings are used not only in machine tools and automation systems but also to an ever increasing extent in the automotive sector, the rail industry, in medical technology and the electrical industry. The many requirements placed on the linear motion bearings are just as varied as the applications in this sector. In the handling and automation sector as well as in transport systems, the focus is on speed and productivity while at the same time low energy consumption. The machine tool sector is dominated by rigidity and smoothness. The selection of the right type of guide is made depending on the loading, speed, stroke, acceleration and also other influencing factors, such as temperature, lubrication, vibration, maintenance and installation. An ATCoat coating can be recommended, depending on the type of application. See for yourself the capabilities of our technical consulting team when looking for the right form of bearing for your application, regardless of whether this involves rotating or linear motion. 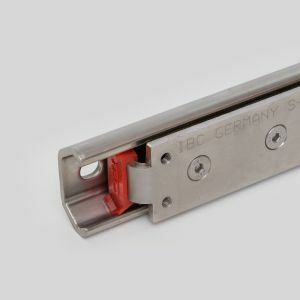 IBC Telescopic Runners are high-quality, precise and very compact telescopic linear motion bearings that are available as partial and full runners. Cage-guided and roller-guided versions are available. The guides consist of an outer profile rail in which a ball bearing-guided inner profile rail runs. The balls that run in the grooves permit the movement of the inner profile in the outer profile and hence the extension. Both the inner profile and the outer profile have grooves. The rolling bearings allow an even, low-friction transfer of force with a high degree of stiffness. The profiles can be set with or without clearance, or they can be preloaded. Non-linear movement sequences can be implemented with the new Flexy-Runner Curve Guidance System. This makes it possible to travel variable curves as well as constant radii. The system offers a very flexible and economic solution. The associated carriers have movable roller carriers and permit consistent running even over complex track sections. Two profile sizes are offered. The configurations are made according to the respective customer specifications. 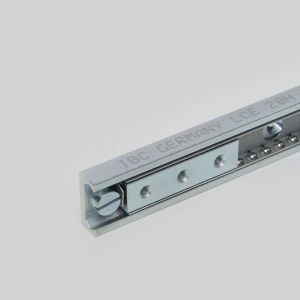 IBC Easy-Runners are high-quality, precise and very compact linear ball bearings. An internal cage guided profile is moved via balls in an outer profile rail and generates the stroke. IBC Easy-Runners are therefore generally characterised by a high power density and, as a consequence, are very cost effective.